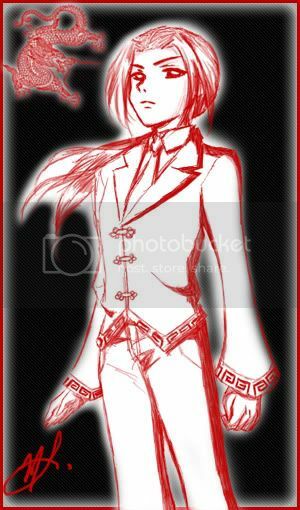 In less than a week I'll be in China and in anticipation I sketched a picture of Yao (China) from APHetalia. Haven't been back since 2005, I'll bet Beijing's changed like crazy. Where China's concerned these past 5 years have been a little crazy, particularly 2008. It's strange that even though I left when I was only 6 I still feel so attached to the country. I really wonder why that is, I mean, rationally speaking I can't even really remember much from when I was 6 or before, just some snapshots, so why did I bawl my eyes out in the aftermath of the 2008 Wenchuan earthquake and why did my heart thump in my chest like a jackrabbit on crack when I watched the Opening Ceremonies for the 2008 Olympics? Feeling sad for a natural disaster, sure, that makes sense. I felt sad hearing about the earthquake in Haiti too, and Hurricane Katrina, and the Tsunami in S. Asia, but my reaction towards natural disasters anywhere else wasn't nearly as emotional as the Wenchuan earthquake (is this considered politically incorrect to say? Oh well, incorrect or not it's the truth...). I think I cried for like, 2 weeks straight, whenever I was home I was online checking up on the conditions in Wenchuan and reading new reports which would always end with me in tears and a pile of tissues in the garbage can. Is it the way I was brought up? Is it because I still have family in China? Somehow neither of those explanations seem sufficient. I've met other kids that, like me, left China at a young age and their connection to the country is almost zero. To me, that makes sense. To me, my reactions makes no sense. If anything I would've expected myself to hold a certain amount of resentment towards China from being forced to do Chinese homework when I lived in the U.S. (like how I hold some...shall we say grudge? ...against French from the constant nagging to learn it). While the other kids in the neighbourhood could go out and play after school I had to read from Chinese textbooks and write Chinese characters. I so hated it, it's one of the clearest childhood memories I have...of course at the time I didn't realize that if I had been allowed to forget Chinese I'd have no way to communicate with like, 99% of my family now, including my dad. Anyway, I'm looking forward to my visit home (home? second home? roots? I'm never sure where my home is these days XD). Seeing the family, eating yummy food (granted the food here in Japan's pretty good but...Peking Duuuuuuuuuuuuuuck~), just being...being back. The city where the Forbidden City lies, where the Great Wall stands, where the ruins of the old Summer Palace remain as a reminder not to forget the past and to strive for a better tomorrow. At the same time I'm a little iffy facing the heat (though Nagasaki's pretty damn hot these days too), the sheer number of people, and Beijing's infamous pollution. Ah well, you can't have 'em all I guess. I'm really envious that your you know your mother tongue. I was born and raised in Ottawa but am ethnically from India. And I know like nothing. I always feel so awkward at family stuff because half of what's going on is being said in Urdu and half in English and I just don't get some cultural stuff so i feel pretty awful sometimes. Anyway I hope you have fun!